I’ve recently been thinking about the question of originality. When discussing the creation of stories, particularly of beginning writers, frequently the question comes up whether the work feels original or rather derivative. Originality is widely treated as perhaps the most important thing for a new writer. Yet at the same time there are famous lines like “all great stories have already been told”, “all art is derivative”, and “there is nothing new under the sun”. How is one supposed to write a good original story like that? I think it is important to make a clear distinction between originality of content and originality of meaning. Content is all the many pieces from which a story is assembled. The characters, the setting, the props, and also plots and situations. To come up with a character or plot, or even just a monster or magic spell that is completely original is extremely difficult to the point of perhaps being impossible. When it comes to these elements that make up a story, I believe that all art is indeed derivative. I think it’s pretty safe to assume that all our storytelling evolved from the telling of accounts of actual events that were embelished for dramatic effect. And it doesn’t take any big leaps to tell stories in which nothing has actually happened in reality. But such stories are not simply made up from nothing. They are constructed from elements that already exist. Any country, state, or nation you can imagine is based on already existing examples in the actual world, and all monsters are evolving embelishments of regular animals. To try to be truly original in these things is not only futile, but also completely unnecessary. However, a story is not just characters, situations, and environments. What is really interesting about stories is how the characters in them react to and interact with the situations and other characters they encounter. How it affects them, what they want to do about it, and what their opinions on them are. This is where writers have the opportunity to put their own unique stamp on a work and create something fresh and original. You are unique and special. Just like everyone else. While this doesn’t make anyone better, it makes everyone different. And this difference is what allows writers to be original with their stories. When you write your own stories, you can have characters do in a given situation what you think they should do. Feel what you think they should feel. And actions have the consequences you think they should have. Instead of what conventions and traditions say usually happens in such situations. I discussed this in the Fantasy Faction forum and one person called this the Originality of Experience. You have characters that are familiar, in situations that are familiar, surrounded by things that are familiar. There is pretty little that can be done about that. But the reason we’re reading or watching a story is because we want to see how it will all play out this time and hoping that it will provide us with a new experience. That’s really what originality is all about. 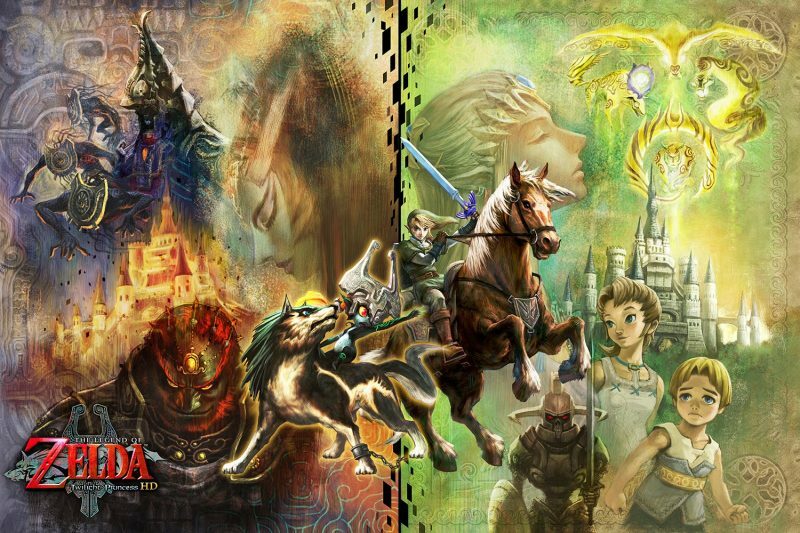 The Legend of Zelda is Sword & Sorcery for kids. Think about it. It makes perfect sense! Fantasy in recent decades seems to have a big thing for magic systems, and I believe partly becuse of the success of Brandon Sanderson. When I see people talk about magic systems it more often than not seems to revolve around different types of spells and the method of their casting. To the point that it seems to be taken for granted as a basic premise for any kind of magic to appear in fantasy. This week I was exploring the idea of converting Apocalpyse World to a Sword & Sorcery game. All in all, it’s a system that strikes me as a really good match right out of the box with the one major thing that is missing from it being a set of rules for spellcasting. But it’s not like the game is completely free of magic. One default assumption of the setting of an Apocalypse World game is the existance of a Psychic Maelstrom, which is the source of seemingly supernatural effects and phenomenons, but whose actual nature and trait are deliberately left completely unspecified to organically take shape during play. 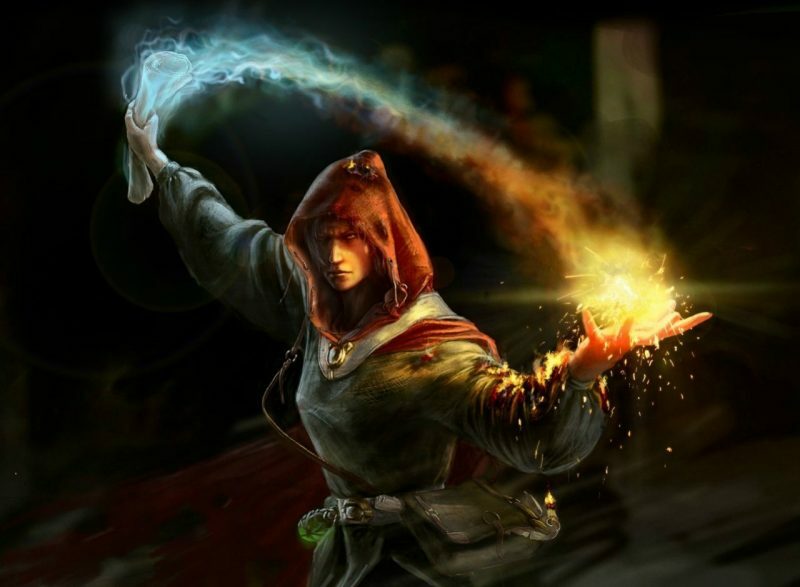 There is a single ability that allows one of the classes to use magical power in a somewhat direct way, but it is again very vague and open ended and does not really fit the image of casting a spell. And looking at older fantasy books, this is actually very much like magic used to be portrayed in fiction. The oldest example of a straight up spell slinger I can imagine is Tim the Enchanter, who can summon up fire without flint or tinder. Gandalf, Elric, or Kane, or any of the sorcerers in Conan’s stories don’t say magic words and have stuff shoting from their outstretched hands. Instead their “magic” mostly takes the form of knowing things and being in contact to powerful entities otherwise invisible to the perception of regular people. With the Ancient Lands, I’ve always felt more like making a “game of the book” rather than a “book of the game”, even with the vast majority of my work over the last year being on game stuff with no actual book anywhere near to sight. But these days I feel once again more drawn to writing fiction, with my game development having reached a point where there’s not really much left to do other than playing it. 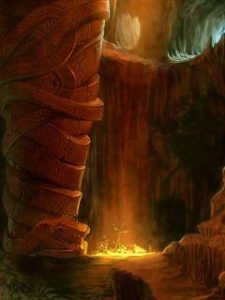 And even with all the worldbuilding advice for writers that adresses magic systems, I find the idea of a spell-less magic to be a lot more interesting. Somehow I’ve never heard of this game (or its predecesor) before. I am not expecting a new Thief with this one, but a proper stealth game with a good looking fantasy setting? I’m on board with that.